This Infrared Sauna model is perfect for relaxing and rejuvenating, comfortably seating 1 to 2 people on the extra deep bench that runs along the back wall of the sauna. The EZ-touch dual interior and exterior LED control panels allow for easy temperature control. This model features 4 energy efficient carbon heaters, and comes equipped with a built-in auxiliary port, auxiliary cord and 2 premium pre-installed speakers. This Sauna operates on a safe 120v/15-amp power and is proudly backed by CE, CETL, RoHS and ISO 9001 certifications, internationally-recognized seals of quality, safety, and professional manufacturing. 1-2-Person Hemlock Infrared Sauna with 4 Carbon Heaters This Infrared Sauna model is perfect for relaxing and rejuvenating, comfortably seating 1 to 2 people on the extra deep bench that runs along the back wall of the sauna. The EZ-touch dual interior and exterior LED control panels allow for easy temperature control. This model features 4 energy efficient carbon heaters, and comes equipped with a built-in auxiliary port, auxiliary cord and 2 premium pre-installed speakers. This Sauna operates on a safe 120v/15-amp power and is proudly backed by CE, CETL, RoHS and ISO 9001 certifications, internationally-recognized seals of quality, safety, and professional manufacturing. 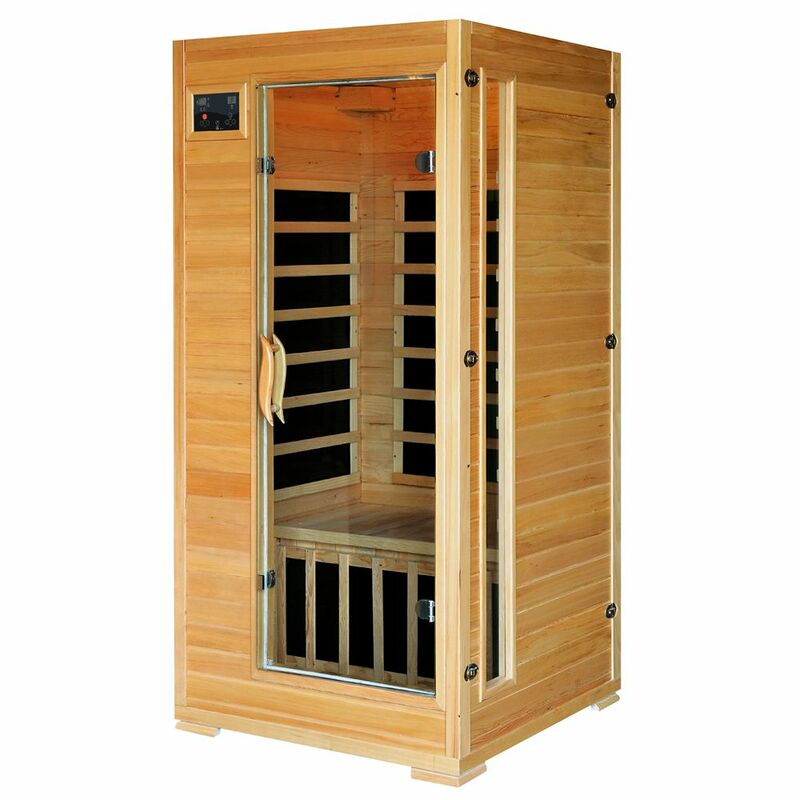 1-2-Person Hemlock Infrared Sauna with 4 Carbon Heaters is rated 4.3 out of 5 by 19. Rated 5 out of 5 by HomeDepotCustomer from Love the sauna! Takes up very little room and feels... Love the sauna! Takes up very little room and feels great!! Rated 5 out of 5 by Mick from Amazing! Very easy to assemble. I highly recommend this product! Amazing! Very easy to assemble. I highly recommend this product! Rated 5 out of 5 by David from I love this unit! However, a few thoughts! My wife... I love this unit! However, a few thoughts! My wife is 125 lbs and I am 165 lbs and there is no way we both fit in this sauna. We picked it up at the store with a trailer, it is on a pallet and very heavy, 350 lbs. Once we got it home, we took each piece downstairs with no problems. Two people are required for assembly, so make sure you have a helper to hold walls up! After assembly, about 60 minutes, it fired right up! It takes about 25 minutes to get to 140 degrees when the basement is 65 degrees. The heat is slightly different than the old school spa sauna, not as overwhelming, and I get a great sweat going after 20 minutes. Rated 5 out of 5 by Sarah from Great 1 person sauna. Super easy to assemble and fits... Great 1 person sauna. Super easy to assemble and fits perfectly in the corner of a room. I love it, so glad I bought it! Rated 4 out of 5 by Stuart from As I mentioned before, I shop at home Depot.... As I mentioned before, I shop at home Depot. I always find what I need and the selections are numerous. I purchased this sauna thinking I was getting a JHN sauna. A Blue Wave Model arrived. True, it was exactly as the picture on your website described it to be. I put it together. It works fine, except the bottom panel does not function at all. That's my story. Have a good day. Anyone test the EMF's on this unit and if so what did it register? 1. Are these 4 carbon heaters: Pure Carbon Heaters, or Carbon Fiber Heaters? 2. What is the percentage of emissivity? 3. Do carbon heaters preclude that they are not ceramic heaters? Can a 6'2&quot; person sit in this sauna comfortably for an extended period?